We had yet another "Sushi Maken" workshop in our hackerspace, in which Erin instructed the participants on how to make various types of Sushi. 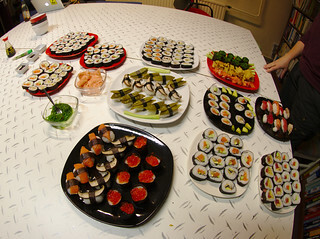 We made Maki, Nigiri and Gunkan sushi. We had Miso soup as an appetizer and proceeded to making (and eating) a lot of sushi.